Last week, Ken & I woke up & decided to go to Cali. We were there by 11 pm that night. We spent a week there & had so much fun! Tuesday, we met up with Ken's brother, Tom, & went to Venice Beach. We also got a little tour of the movie set where he's been working. On Wednesday, we hung out with my sister, Jamie, & her family. Thursday, we went to Disneyland & California Adventure all day with my sister & her family. Friday, we went shopping with my grandparents, then swimming, then we hung out with my brother, Slade & his family. Saturday, we went to Seal Beach in the morning & walked down the peir to show the kids where we got engaged, then we went swimming with the family & got totally sunburned. Then on Sunday, after church, we decided to head home & stay in St. George for the night. We stayed at a nice hotel & got some more swimming in, & finally got home yesterday! It was such a fun trip & it was so good to see everyone we were able to see. Maeli: Mommy, you giving me a headache! Maeli: Pretty, Pretty, Pretty...Maeli is a princess! Me: Here's your cinnamon roll, Maeli. Maeli: I wanna whole one! Me: Nope, you & Kenny have to share. Yes, Maeli is my angry child, but very confident as well. Hmmmm...does that make her a brat?=) I just can't help but laugh when she has her little fits of rage. She's such a tiny girl, with tons of personality. She's outgrown naps, but we have rest time everyday. She watches a movie or cartoons while she "rests". Whenever I open her door to let her out of rest time, she has successfully messed up every single toy in her room. Today, I heard her jumping on her bed, screaming a song at the top of her lungs for about ten minutes.=) She just completely enjoys herself. 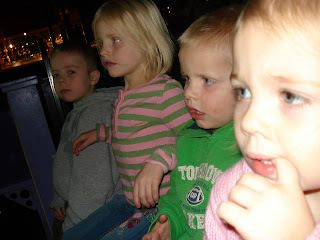 Yesterday, we decided it would be fun to take our kids to the Dinosaur Museum. We called up our good friends to come with us. We had so much fun! Kenny is sooo into dinosaurs right now, so he ate up every minute. They had a little area to dig for dinosaurs, so we let the kids play for as long as they wanted, while we got a chance to rest our feet. Here's the only shot I have of all three kids together. 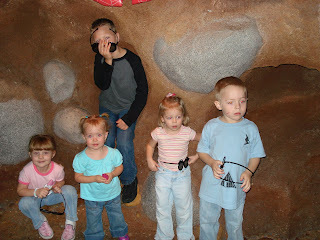 Here was our crazy group of kids, minus the two babies! We also celebrated Kenny's birthday last month. He's now a 5 year old! His Aunt Amiee & Uncle Earl mailed him a gift card to the dollar store & these are a couple of the items he chose to purchase with that gift card!=) Yep, that's a grill & ginormous ears! We love this kid! This was at one of the Circus Circus shows. I loved their faces! 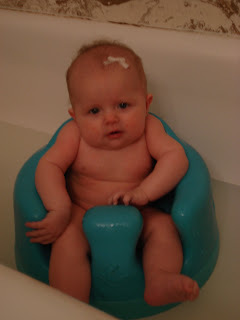 Bathtime at Uncle Slade & Aunt Sara's house! This is one healthy baby! Haha. 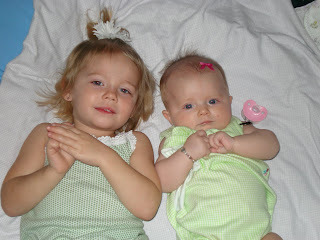 Maeli & Sadie at Grandma & Grandpa Great's house. We stayed at their house the whole time we were down. The kids must have thought we moved there or something! 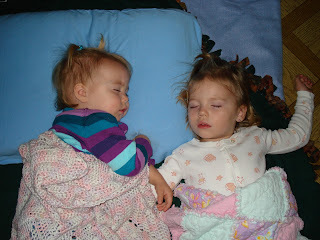 Kaydence & Maeli had a lot of late nights together! This is a really sweet picture...as it should be...Slade posed Kaydence, she actually fell asleep about 2-3 feet away from Maeli, but we needed a good shot! Maryn, Kaydence, Charles, Maeli & Kenny. We were waiting for the Bug's Life movie. We are the Howards! We have three kids: Kenny, Maeli, and Sadie. We 're your typical American family. We enjoy eachother...most of the time! Welcome to a little piece of heaven, the Larson Fam-Bam!! !